Having already completed the first four years of his studies at other monasteries, Khenpo Rinpoché quickly completed his education at Jangchub Ling. After three years teaching lower classes in the monastic college, he was enthroned by His Holiness Drikung Kyabgön Chetsang Rinpoche as as a "Khenpo" in 1998 and spent three more years teaching Buddhist philosophy at the Institute. In between his busy schedule first as student and later as instructor, Khenpo Rinpoche completed the Ngondro, Cakrasamvara and other practices while in retreat. 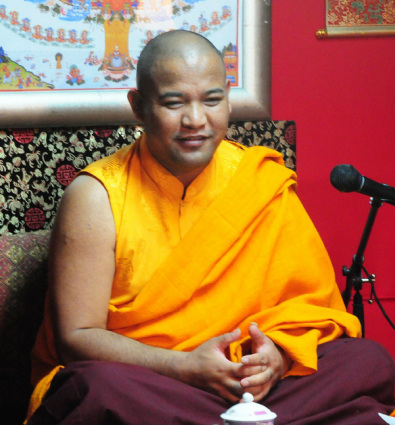 In April 2001, Khenpo Rinpoche arrived at the TMC to assist Khenchen Rinpoche and also to improve his mastery of the English language so that he can be of more benefit to the spread of Dharma. He began teaching at TMC in August of that year and was subsequently appointed as co spiritual director of TMC by Khenchen Rinpoche. 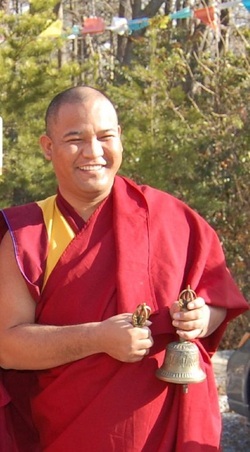 Khenpo Rinpoche is known and loved for his engaging teaching style as well as his complete lack of pretensions.